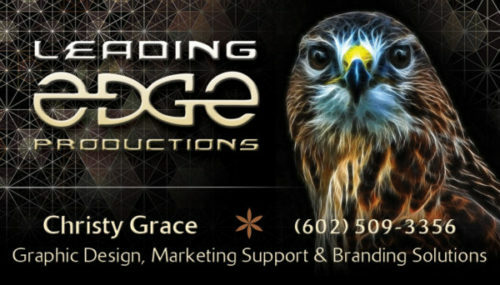 Christy Grace (owner of Leading Edge Productions) is available for freelance design, short term projects and long term contract work for marketing management. We can work together via Skype, FaceTime, email, phone or in person (northern Colorado). Contact Christy to schedule a no-cost, no-obligation 15-minute consultation to identify your marketing goals, brainstorm ideas and develop a plan to take the steps to reach your desired outcome. 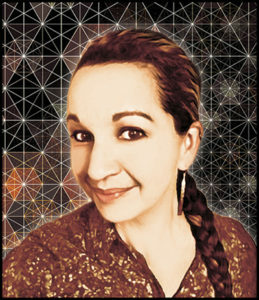 Christy works in Adobe Creative Suite for all media production. She can provide print-ready files and find the best deals on all printed materials such as business cards, brochures, rack cards, invitations, flyers, posters, stickers, promotional items, and anything else you need to promote your business! With a passion for art and design, Christy enjoys creating custom imagery that best represents who you are, what you’re offering, and who you’re targeting. You marketing message needs to be compelling, memorable and unique. The hawk is a symbol for “the messenger” – a fitting representation for marketing. 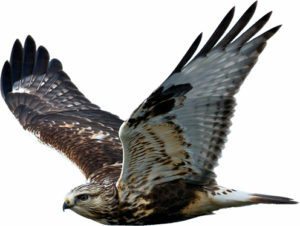 The hawk totem provides wisdom as it has the ability to rise above it all and see situations from a higher perspective. It identifies a target and intensely pursues with determination, precision and grace. To me, the hawk feels like my “spirit animal” with keen vision, powerful intuition, and a deep connection with nature. Its instinct is to quietly observe, focus on the task at hand, and knows when to act with purpose and intention. I admire and appreciate hawks, as they consistently exhibit a bold presence, leaving a lasting impression upon those they’ve visited – just like how exceptional marketing can do for you. I’m delighted that a pair of Cooper’s hawks are nesting in a big cottonwood tree in our front yard. I love to hear them screech and watch them fly around my neighborhood. Christy has an extensive background in advertising, marketing and multi-media production. Leading Edge Productions, LLC is her freelance design business providing custom graphic art, printing services, marketing consultation, media design, creative advertising campaigns, website development, photography & image manipulation, audio production, presentations, and event coordination. As a creative graphic designer, marketing professional and advertising specialist, Christy has worked for several ad agencies and media outlets, as well as with various companies for independent contract work. She also enjoys event planning and promotions, as she has years of experience and expertise in coordinating all aspects of private or public events. In addition to decades of training in various aspects of marketing, Christy is also a certified Hypnotherapist, NLP Master Practitioner, Permaculture Designer, and Yoga Instructor. She has a holistic approach to life and supports eco-friendly products & services. She lives with her husband and daughter in northern Colorado; enjoys art, dancing, live music, yoga, gardening, mountain biking, hiking, camping and outdoor recreation – striving to live in balance with nature as much as possible. Find me on >> Facebook << -or- LinkedIN.